The cold temps can hit hard and fast during this time of year and it seems that we went from wearing dresses and sandals one day, to having to bundle up in scarves, turtlenecks and jackets the next. Our tried-and-true trick for battling the chill? Not automatically reaching for our parkas and wool coats (trust Us, there will be plenty of opportunities to wear them in the coming months), but rather, layering up with a lighter coat and a thicker knit underneath. It’s all about being strategic. A jacket that’s not super heavy won’t be a burden to tote around should it get warmer throughout the day, but it’ll still keep Us warm should we need to throw it on in the evening. 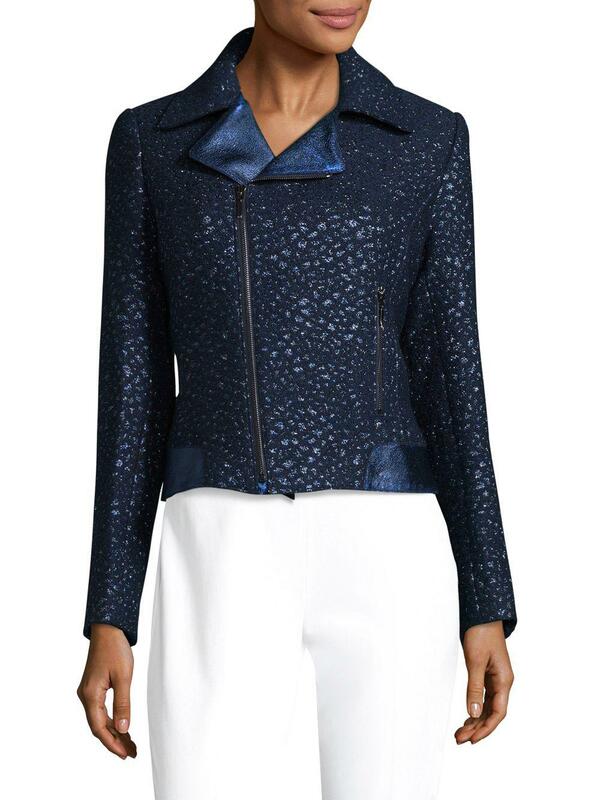 See it: Snag the Elie Tahari Mae Leather-Trimmed Jacket for over $373 off the original price tag (was $548, now $175). Use code “DONTWAIT” for the additional 20 percent off! Lucky for Us, we found just the topper. 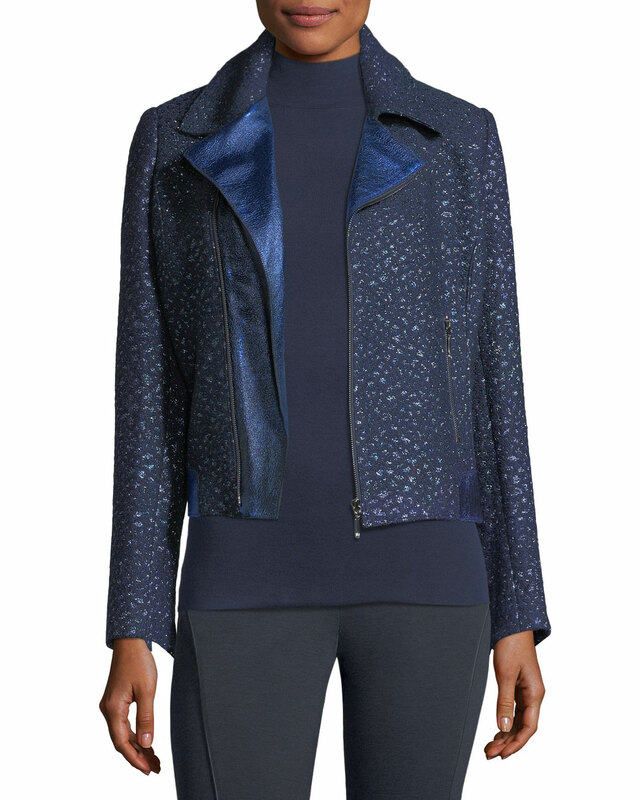 The Elie Tahari Mae Leather-Trimmed Jacket is the perfect design for those chilly autumn days. The style is made of a virgin wool blend that’s designed to keep Us warm, plus a matte stretch lining to ensure we’ll be comfortable (and can still move around)! The leather trim gives the jacket a cool girl edge and the asymmetrical front zip exudes biker babe vibes. The style also has zips at the cuffs that you can use to comfortably scrunch the sleeves up or leave them flat. The beautiful midnight blue metallic style can add a fashion-forward flair to a basic tee and jeans, but we’re just as excited to pair it with a little black dress (check out this sequin style by Elizabeth and James) and pumps for a night out. We’re most excited to drape the jacket over a party frock for getting those last minute rooftop parties in before it’s way too cold. The best part about the look, however, is the jaw-dropping price tag. Originally retailing for $548, it’s been marked down to $219. However, with the ongoing Saks Off Fifth flash sale, the topper has an additional 20 percent off, making the final price $175. That’s nearly $373 in savings! If that’s not a steal, we don’t know what is. Must move quickly, though — the sale is only going on until October 18, so you can bet that we’re adding this to our carts before our size sells out! See it: Grab the Elie Tahari Mae Leather-Trimmed Jacket for over $373 off the original price tag (was $548, now $175). Use code “DONTWAIT” for the additional 20 percent off. Sale is over tomorrow, October 18, so shop fast!